We have previously mentioned our citizen science effort to identify biomedical concepts in text, Mark2Cure. However, there are tasks aside from text annotation that can overwhelm scientists. Cryogenic electron microscopy (cryo-EM for short) is an increasingly popular method for creating 3D models of proteins. 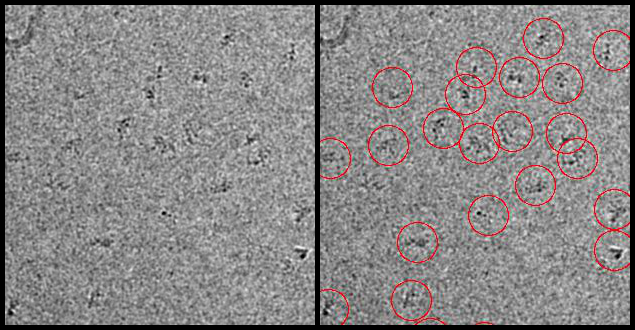 In single-particle cryo-EM, samples of a single protein are frozen in extremely thin ice and imaged with an electron microscope. The enterprising microscopist is then required to pick the protein particles from each image so they can process the 2D protein particles into a detailed 3D model. A single project for cryo-EM involves thousands of cryo-EM images, from which hundreds of thousands of individual protein particles need to be identified. This can take weeks for a single scientist to accomplish by hand. The majority of scientists opt for automatic pickers, but these tend to both miss lots of proteins and make many incorrect picks. To help improve the quality of the particle picks and save scientists’ valuable time, we have partnered with Zooniverse to introduce protein picking to the citizen science zeitgeist. Zooniverse is a citizen science platform that has its beginnings in analysis of galaxy shapes, but has since expanded to a plethora of subjects such as penguin counting and annotating vintage scientific texts. We are gearing up for a full launch, but first we want to test our system. Check out our new Protein Picker application and try your hand at particle picking, and please leave any feedback via the “feedback form” tab at the top of the screen. Happy picking! Please test our system and leave your feedback, we appreciate it!